Where does Bloodmoon take place? Bloodmoon is set on the island of Solstheim to the northwest of Vvardenfell. You'll find an untamed wilderness to explore, populated by dangerous creatures and new dungeons like ice caves and Nordic burial tombs. What are the key features of Bloodmoon? Does Bloodmoon require Tribunal to play? No. Bloodmoon only requires Morrowind. Is Bloodmoon compatible with Tribunal? Yes. Both expansion packs work together. How many hours of added gameplay are there? Between 20 and 40 hours, depending on how many of the quests you do. You will need to contract lycanthropy from another werewolf. What is special about being a werewolf? Playing as a werewolf completely changes the way you play the game. You get bonuses to your strength, agility, and speed. You'll gain a new ability called Eye of the Wolf. You do not use weapons or spells, but attack with your claws. Insane dreams will haunt you each night - dreams that urge you to fulfill maddening werewolf quests. Do I have to start a new character to play Bloodmoon? No, like Tribunal, Bloodmoon is designed to be played by any character at any time, whether you are just starting, in the middle, or have already finished the main quest of Morrowind and/or Tribunal. However, finishing Bloodmoon's main quest will require you to have a high level character. I have a very powerful character. Will Bloodmoon offer new challenges? Like Tribunal, Bloodmoon is aimed at powerful and high level characters. Will the new functionality in Tribunal, like the revised journal and map, be in Bloodmoon? Yes. You will be able to sort your quests by name and make notes on your map in Bloodmoon. Is Bloodmoon compatible with TES Construction Set? Yes. 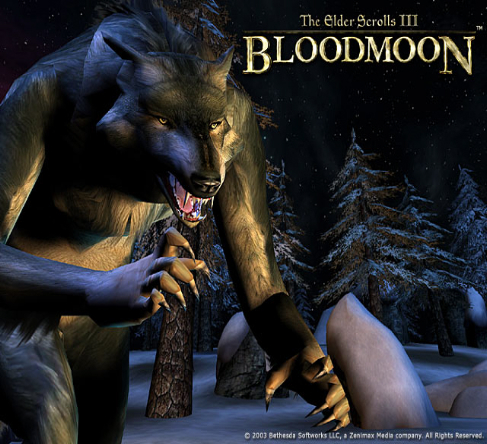 Bloodmoon is another master file, and the Construction Set has been designed to handle multiple master files. Your current plugins will still work in conjunction with Bloodmoon, and you will now be able to make plugins that make changes or use assets from both the Morrowind master and the Bloodmoon master file. They are the same as Morrowind. Is Bloodmoon coming out for Xbox? No. It is a PC only product. Bloodmoon is scheduled to ship in May 2003. Q: How do I get to this new continent? A: Take a boat to Khull and a Khajit will take you there by boat. Q: How do I become a Werewolf? A: Go out at night and you'll find one with lycanthropy. Q: Where do I start the main quest? A: Talk to the Captain in Fort Frostmoth. Q: So with Tribunal and Bloodmoon installed, how many hours will it take to complete the whole thing? A: Without downloading any mods, you are looking at 80+ hours alone full of content. The longest RPG I've ever played! Q: What level do you reccomend that I be before I land in Solsthiem? A: You'll need to be at least 20+ to survive this harsh land. You'll need to be 40+ if you want to complete the main quest. Q: What mods, if any, do you recommend installing to enhance gameplay? A: My Merchant mod, Indybank, and anything that doesn't change what's already in the game. If you're not sure how a mod will affect your game, create a "test save" and select that mod. Never use your main save game to test out mods.